In 6-quart Dutch oven, heat about 3 quarts (12 cups) water to boiling. Add bell pepper halves; cook uncovered 1 minute. Remove pepper halves from boiling water; immediately plunge into ice water until cold. Drain. In medium bowl, mix beans, rice, onions, 1/4 cup cilantro, oil, lime juice, salt and garlic until blended. Stir in tomato and cheese. Spoon mixture evenly into pepper halves. Place in baking dish; cover tightly with foil. 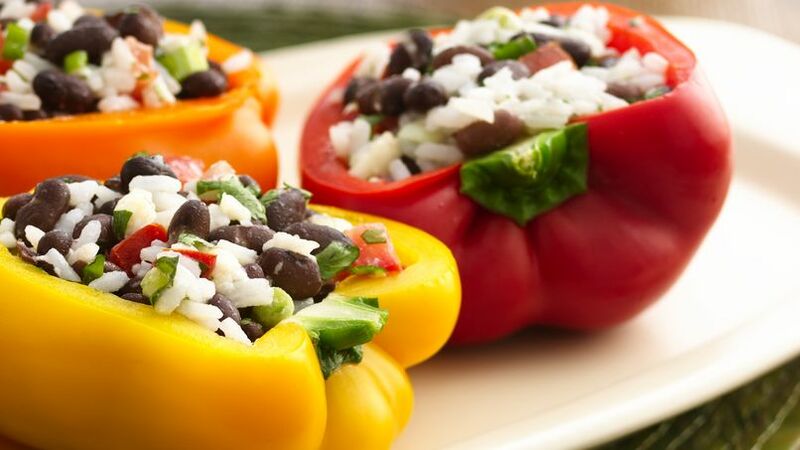 Bake 25 to 30 minutes or until peppers are tender. Sprinkle with additional cilantro.